The medical, manufacturing, pharmaceutical, food, beverage and laboratory industries all use chiller systems to cool their products in an even, controlled manner. Industrial companies also use chillers to keep machines at a safe temperature that are heated as a result of manufacturing processes. Plastic molding, metal working, welding, die casting, chemical processing, breweries, lasers and printing presses all use various chiller systems to improve their products, maintain safe temperatures within their facilities or decrease processing time. Industrial chillers are measured by their cooling capacity in terms of tons, which is equivalent to the heat of fusion of one ton of ice, or 12,000 Btu/h. Capacities range from portable chillers with fractions of a ton to permanent multi-unit “plants” with thousands of tons of cooling capacity. Industrial chillers either use absorption or vapor-compression refrigeration cycles to produce their cooling effect. The absorption process uses a source of heat to drive the cycle, while the vapor-compression process uses an electric or gas-powered compressor to drive the cycle. Both processes involve a cycle of condensation and evaporation, wherein heat is strategically released in one place and absorbed in another to provide cooling where it is needed. A number of different refrigerants may be used, most commonly water, ammonia, carbon dioxide, sulfur dioxide, alcohol, brine or methane. During the condensing phase, either water or air from outside the system is used to cool the compressed refrigerant vapor to make it become a liquid again. Water cooled chillers are the most effective at this task, but necessitate a water pump, and also require a cooling tower if the water is to be recycled. Air cooled chillers are simpler, using outdoor ambient air to blow over and around the condenser tubes, carrying some of the heat energy away and into the atmosphere. Evaporation cooled chillers function very similarly to air cooled chillers, except a mist of water is introduced around the coils in order provide extra cooling by evaporation. 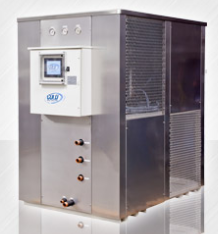 Recirculating chillers signify any type of chiller that works with a fixed amount of clean coolant in a closed loop. 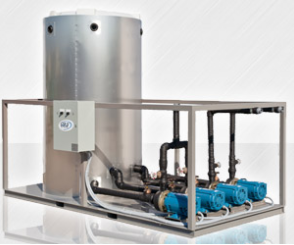 Open loop chillers, on the other hand, control the temperature of a tank full of liquid, and pump that liquid through the heat exchanger to provide cooling. Industrial Chillers Industrial chillers are refrigeration systems that chill liquids, such as water, oil, brine, alcohol or chemicals for industrial purposes. The chilled liquid, or coolant, is then used to cool air or process equipment either directly or indirectly via heat exchangers. Many large commercial and industrial buildings use chillers for their air conditioning systems.